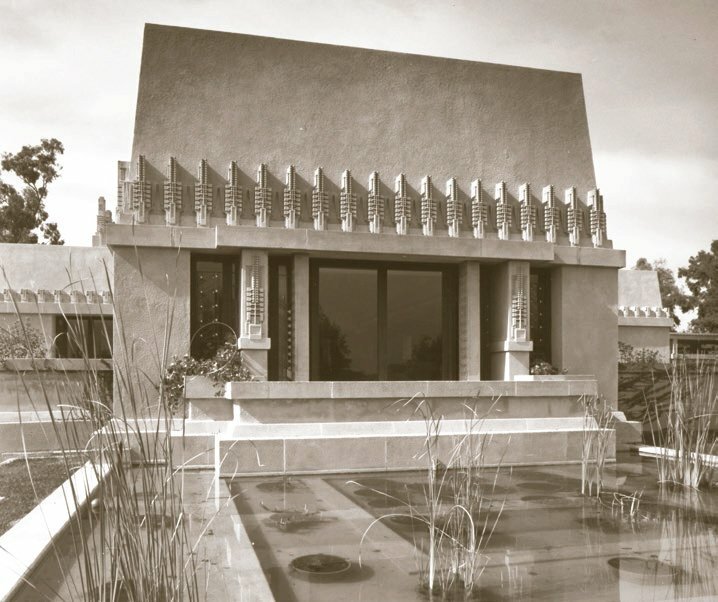 Architect Frank Lloyd Wright’s ‘textile block’ houses, including the Hollyhock House (above) of 1920, used decorative block designed by Wright. 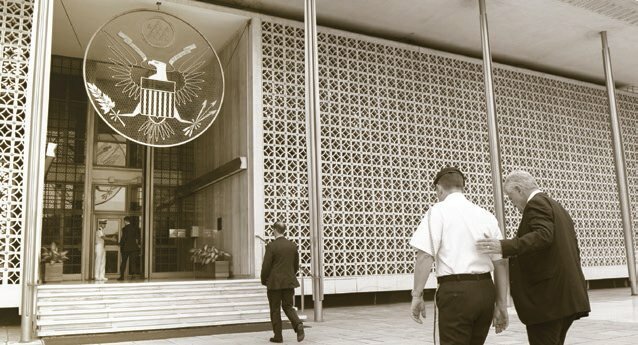 In the 1950s, Architect Edward Durell Stone used screen block for his design of the U.S. Embassy in India (pictured here), and his move put decorative block on the map. 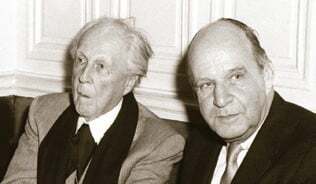 Frank Lloyd Wright (left) and Edward Durell Stone (right). Cruise through Palm Springs' wonderland of mid-century modern homes, and you'll surely run into them. Or observe a cluster of apartments from the same era. You know the type—two to four stories, rectangular or L-shaped, built above parking, of no architectural distinction. Then take note as something lively catches your eye—a super-cool wall of concrete block. As one period block maker's ad bragged, "Concrete block can be fun and games." Decorative concrete block—whether perforated to form screens or with projecting sections to create shadows—flourished starting circa 1955. "Something brand new in concrete blocks is now being introduced to the building public," the New York Times reported in the summer of that year. "It is a distinctive block that combines structural value and décor within a single unit." Four years later the paper turned its attention to blocks with projections, with the headline 'New textures for walls.' Reporter Cynthia Kellogg described concrete blocks with raised "pyramid projections" and "shadowall blocks." "Some of the American designs approach the look of art, with abstract patterns such as those found in primitive bas-reliefs," she wrote. Also in 1959, Business Week reported in a headline, 'Concrete Blocks Get Some Class.' Thanks to automation and faster curing of concrete, the magazine said, manufacturers were churning out more than 300 varieties of decorative block. "Despite its popularity as a cheap and versatile building material, the concrete block has never had much glamour," Business Week continued. "Now, though, it seems to be graduating into sophisticated company." "The concrete block stepchild turns Cinderella in new forms," the New York Times chimed in, three years later, reporting that "great progress has been made in creating new and attractive sizes, shapes, textures, and colors of concrete blocks, offering a wide variety of architectural and decorative possibilities." Yet by the start of the 1970s decorative concrete blocks were falling out of fashion. Las Vegas real estate broker Jack LeVine, one of their greatest fans, whose obsession has led him to put together a 50-part Internet series documenting what he believes is "every decorative concrete block design that we could find in Vintage Vegas," says that in areas built after the early 1970s decorative blocks are not to be found. Still, the blocks are having a resurgence today, with mid-century modern mavens seeking them out in situ, as serious about their search as bird watchers, and carefully cataloging every variant. Some homeowners buy them from the few manufacturers that remain to give an instant retro look to their homes or gardens.